Welcome back! Today I’d like to share a card I made for OCC Merry Making. This card was inspired by a card demonstration in the class that used non-traditional images to create a holiday card. The demonstration used some non-traditional colors as the card base and I wanted to give that a try as well. For this card, I used images from 3 different stamps sets. The gold floral embossed image is from Inkadinkado Flowers stamp set. 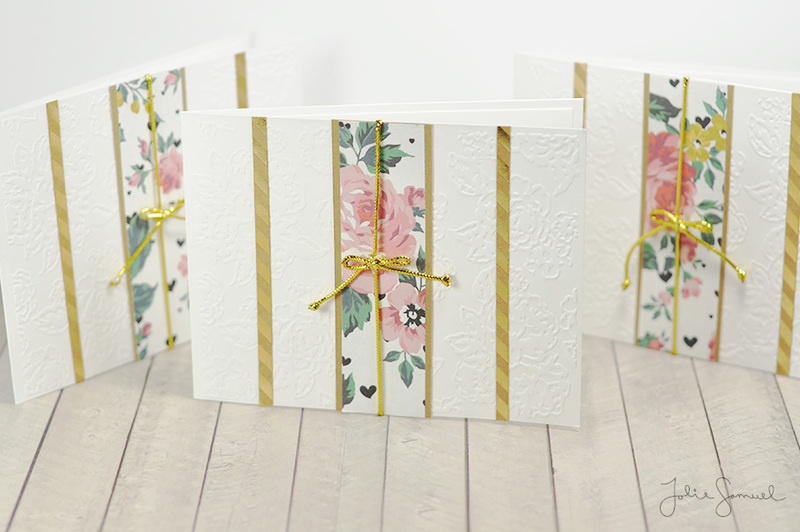 The background tone-on-tone images are from Altenew Vintage Roses and the sentiment is from Little Yellow Bicycle Faith (CSS-104). I love adding extra embellishments with white gel pen and typically do so by just creating lines or faux stitching. This time I took a note to try some scattered dots similar to the card demo as well. I think using the white is a simple and easy way to bring in some nice contrast. Thanks so much for stopping by and I’ll see you again real soon with another project. Welcome back! This is the last of the note card series and I’m so pleased that you have enjoyed keeping up with each days post! It’s truly become difficult for me to pick and choose which set is my favorite. There are so many different elements on each card that I really do love. 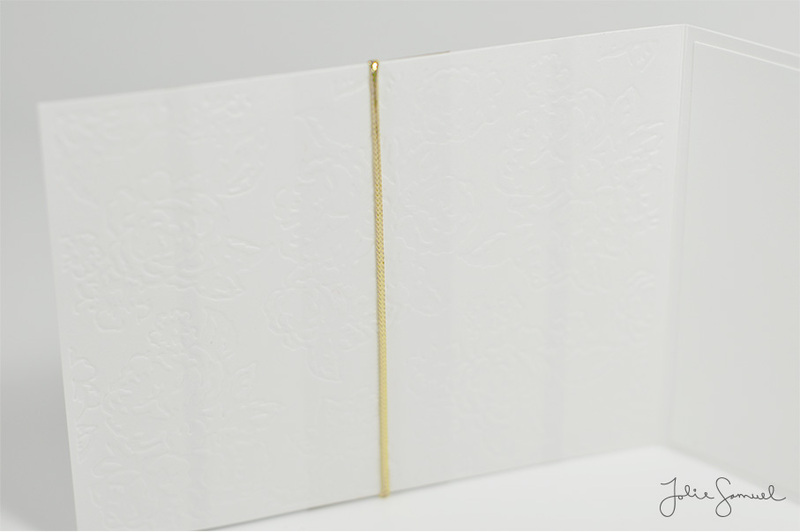 These cards are a set of 4.25″ x 5.5″ standard size note cards. They are on a kraft 80lb card stock and have a thickness which makes them perfect for mailing and gifting – they are light weight! I love how the pattern switches up a traditional floral color scheme. Notice how the flower is more monotone than the background? I love that! It’s so unexpected in a design. 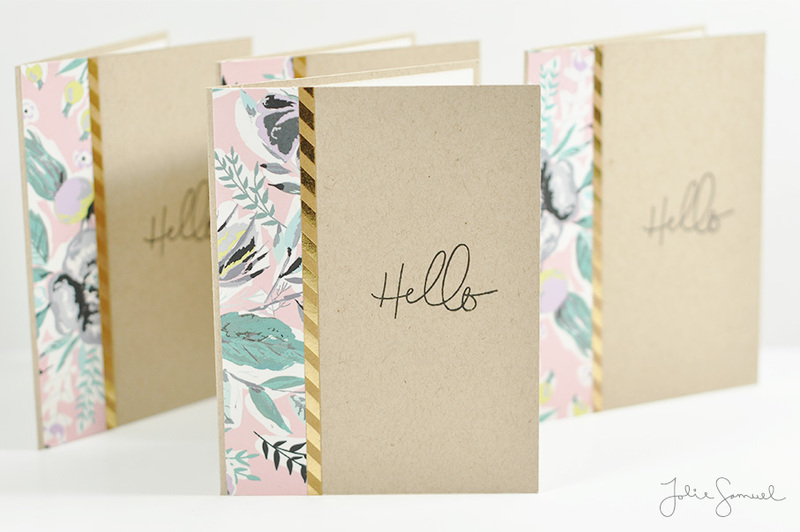 I separated the pattern with a kraft and gold foil stripe and gave each note card a simple ‘hello’ greeting. Thanks so much for visiting and I’ll see you again real soon with an all new card series! 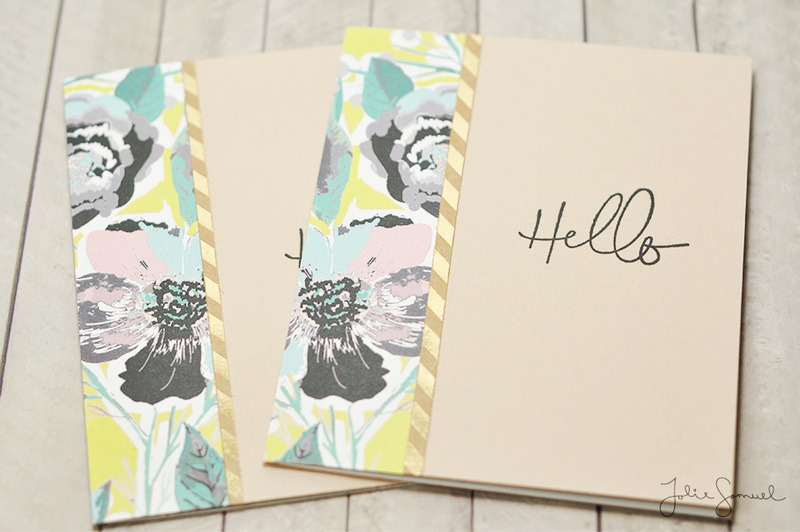 I have just a few more note cards to share for this August reveal. If you have missed any or would like to see the collection, be sure to check out the gallery page here on my blog. This card is simple and packs a punch. I had a bit of the gold foiled kraft paper I made several days ago and wanted to use it in a subtle way on this card. 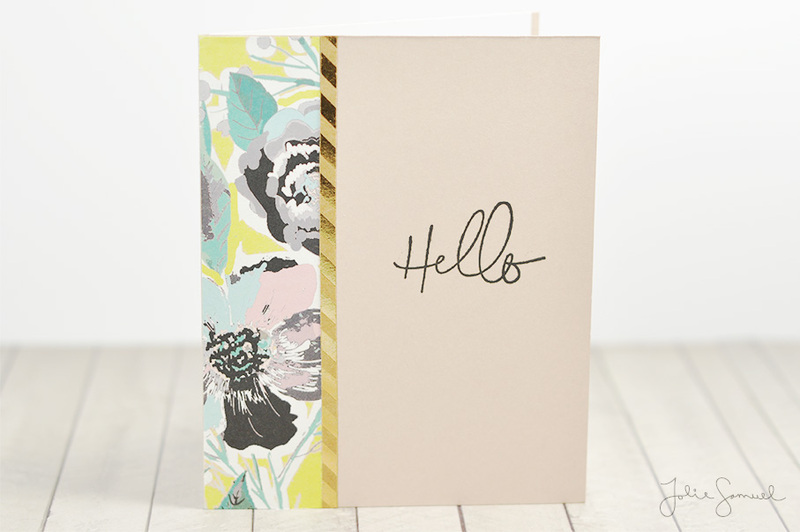 I added it to create a separation between a busy floral pattern and a plain kraft card stock. Years ago, when I first started making cards, I used to have a difficult time creating white space on cards. 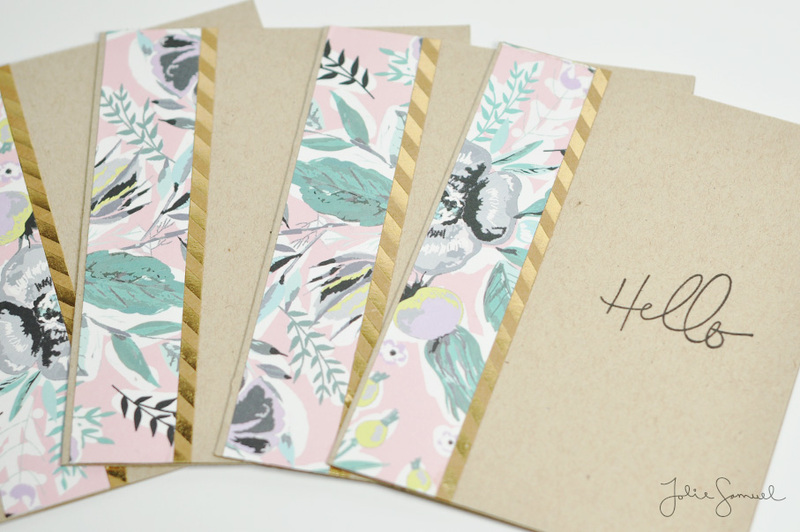 I just love these patterns and prints so much that I feel the need to put them on an entire project. It took me some time to realize that sometimes, it makes a bigger impact when you add in some white space. I love how the pattern still catches my eye, but the card is not ‘busy’ in style. This note card measures slightly smaller than a standard A2 size card. 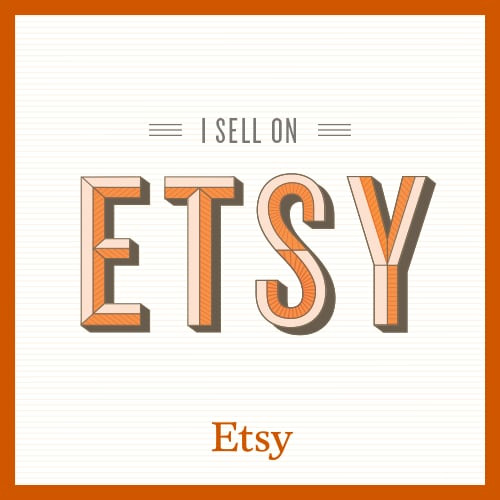 It is around 4.25″ x 5″ – and fits in a standard size envelope for easy mailing. Welcome back! I’m on that summertime floral kick once more! 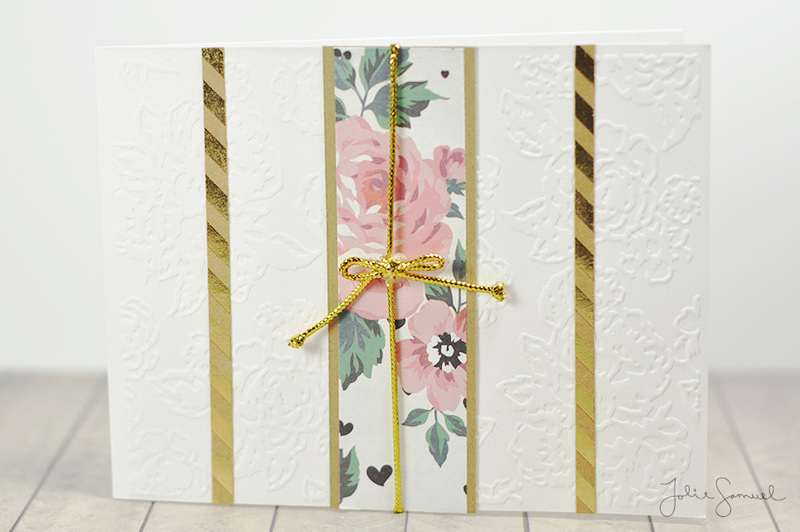 Here’s a card using a similar pink and yellow themed floral but with a slight change. The black brush strokes are now replaced with whimsical little hearts – did you notice?! This pattern is typically not something I would gravitate towards, but the use of lots of white space and those fun little hearts made it incredibly fun to work with. For this card, I broke out a 6×6 pad of kraft papers that I have and gold foiled some stripes on to it. I then trimmed down those pieces to give my card what I like to call ‘suspenders’! Just below those suspenders (lol) I have a gorgeous embossed floral that I used on the base of my card. I feel like it resembles white lace on this project. Very classy indeed! Here’s a peek at the interior of the card as well. Hope you enjoyed reading about my latest card and I will be back tomorrow with another project!